One of the goals of this blog is to encourage others to sew. So when I suggested to the fabulous Bron at Flat Bum Mum that we team up to make a skirt and she said YES I was thrilled. If you haven't checked out Bron's blog you really have to. She's a stylish Mum of 3 (including twins, I always feel like twin's are worth extra points it the Mum stakes!) who writes an interesting and funny real life blog for real Mums. We each made a skirt using this tutorial. I had this gorgeous fabric (from The Remnant Warehouse) in my fabric stash for a long time, so I posted it on IG and asked what I should make with it. The almost unanimous answer was maxi skirt! You were all so right! I have a confession to make. I didn't own a maxi skirt. Not one. Why??? Here is Bron's beautiful skirt, didn't she do a great job? Bron at Flat Bum Mum looking amazing! I love that you can't make such different skirts with the same simple pattern. 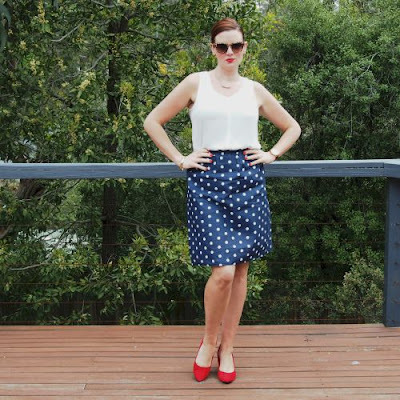 So have a go at this simple skirt - I'd love to see your creations! LOVE your maxi!!! The perfect use of that material. Thanks for getting me back into the sewing groove. I love both those skirts! You look beautiful! Both skirts are adorable! I love your maxi! It's such unique and pretty fabric! It's making me want to do a long one for Fall! Both skirts are fabulous! I am always a fan of polka dots and the print of your skirt is so head turning (not to mention that the color combo is one of my favorites). Also, your comment about not having to shave your legs as much when wearing maxis is oh-so-true! It's another thing I also love about wearing tights with dresses and skirts. I can let the leg-shaving go for a few days in the fall thanks to that as well. It's the little things, right? Although shaving one's legs as a tall woman is no little thing I suppose. Love your maxi skirt, the print and color is so pretty!